Miss Julia’s adoring fans sent this novel straight to the New York Times hardcover bestseller list. But everyone’s favorite steel magnolia isn’t one to rest on her laurels. It’s summer in Abbotsville, and Miss Julia’s cousin Elsie calls in an old family debt, asking Miss Julia to teach her granddaughter how to be a lady. When the rude and unkempt Trixie arrives, it’s clear Miss Julia has her work cut out for her. Meanwhile, Sam’s campaign for state senate is in trouble. Miss Julia enlists Lillian, Latisha, Lloyd, and Hazel Marie to whip Trixie and the campaign into shape! 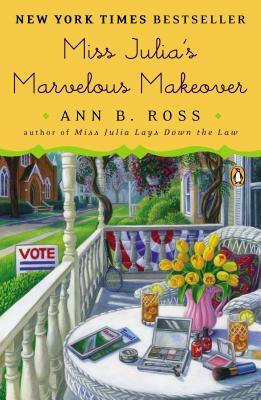 Ann B. Ross is the author of eighteen novels featuring the popular Southern heroine Miss Julia, as well as Etta Mae's Worst Bad-Luck Day, a novel about one of Abbotsville's other most outspoken residents: Etta Mae Wiggins. Ross holds a doctorate in English from the University of North Carolina at Chapel Hill, and has taught literature at the University of North Carolina at Asheville. She lives in Hendersonville, North Carolina. "Yes, Miss Julia is back, and I, for one, am one happy camper."